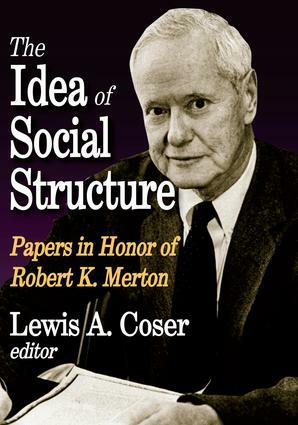 Written and compiled by friends and former students, The Idea of Social Structure honors Robert K. Merton, considered one of the premier sociologists of the twentieth century. Along with Talcott Parsons and Marion J. Levy, Merton was emphatic in his use of the term "social structure"—however different they were in defining and refining the term. The chapters in this volume address many of Merton's diverse sociological theories and, in turn, his theories' impact upon a very large sociological territory. The volume includes major statements on the context of working with Merton by Lewis A. Coser, Paul F. Lazarsfeld, Robert A. Nisbet, and Seymour Martin Lipset, as well as memorable statements covering Merton's interests in the sociology of knowledge and science, planning communities, medical education, relative deprivation, everyday life, political roles, and communication media. This is a powerful sourcebook for understanding the work of Merton and of his intellectual successors. Nisbet called the decade of the 1930s among the most vital and creative periods in American history. It was certainly a period of intense struggle—political, military, and ideological. But the formation of modern sociology was without question one of the crowning achievements in the scientific evolution of the century. The volume is sharply focused on Merton's work and deeply appreciative of the nature of his contribution. It is a landmark effort in the study of sociology as history.